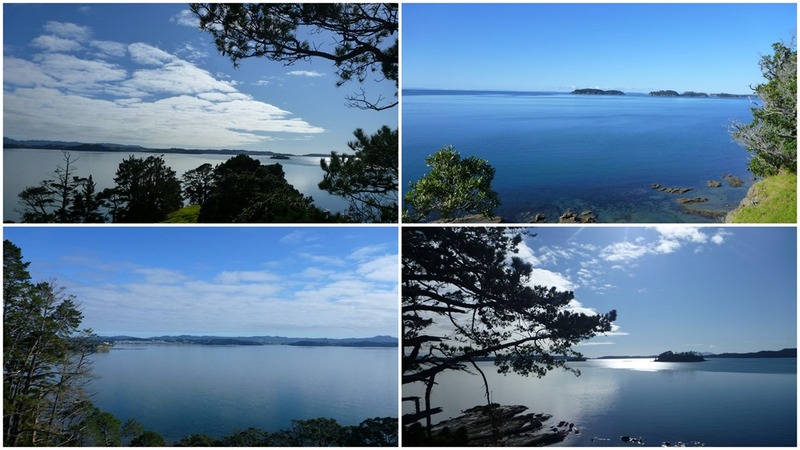 « Christmas in NZ… Let’s go tramping! Our first “let’s go away and see something else” couple of days were middle of July, when we needed a break from job offers, CVs, applications… We were actively job seeking for more than a month, without much success… Alex was in between interviews and I was nowhere… just waiting for companies to be interested in my profile and call me. Well, as I said: nowhere really! 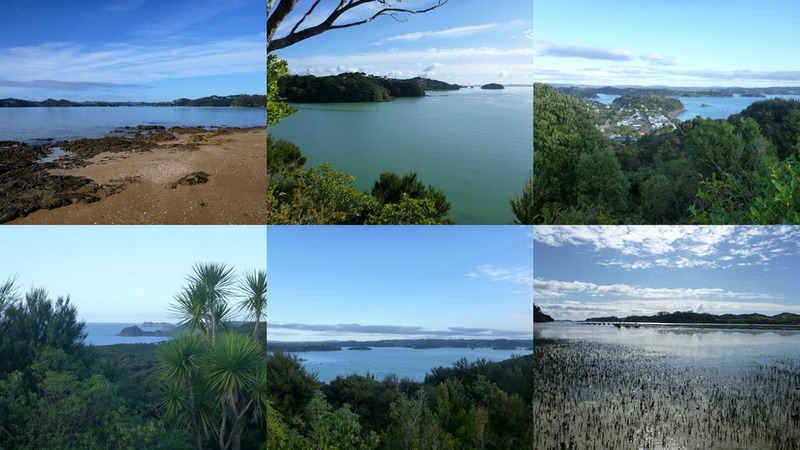 So we decided to leave Warkworth for a couple of days and drive north to Paihia, to hang around at the Bay of Islands paradise. Which was great! 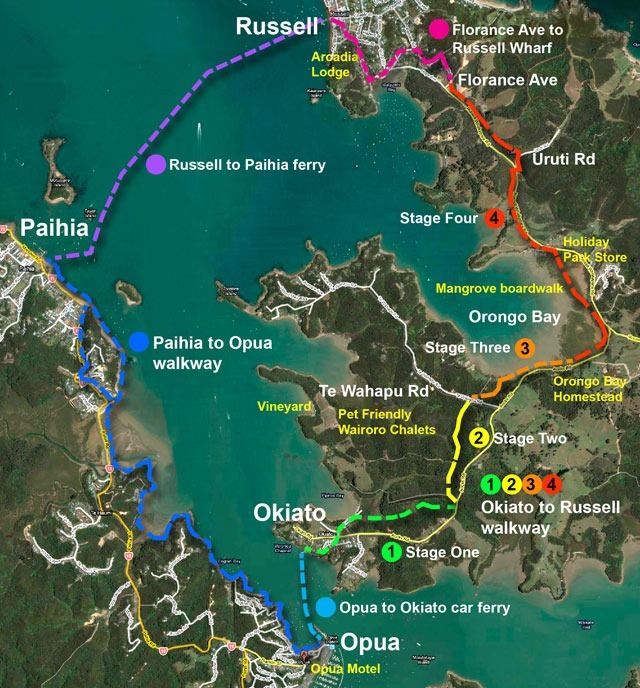 With a sunny and warm weather, we walked the “Full circle coastal walkway”: Paihia to Opua to Okiato to Russel. 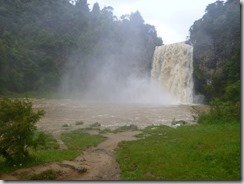 A long and nice walking day! On the west coast, in Piha, there is a surfer paradise… well, the weather was not that great that day, pretty cold still in September, but we walked along a nice beach and on top of rocks. Auckland is sitting on a dormant volcanic field. About 50 volcanoes are around and shaped this area. 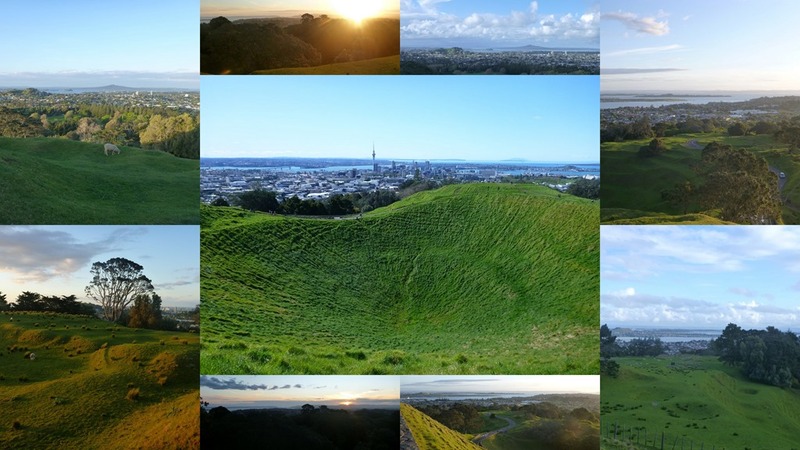 This is why there are beautiful hills in the middle of the city… some steep ones, some flatter ones, some craters… everywhere in Auckland where you have a park, there is a hill, and it is most likely a volcano… well, it does help to take a bit of height and see the city from a different angle! There are sheep and cows in some of these parks, and it doesn’t feel like you are in the middle of the city anymore! In November, I felt like having a look a the west coast again. 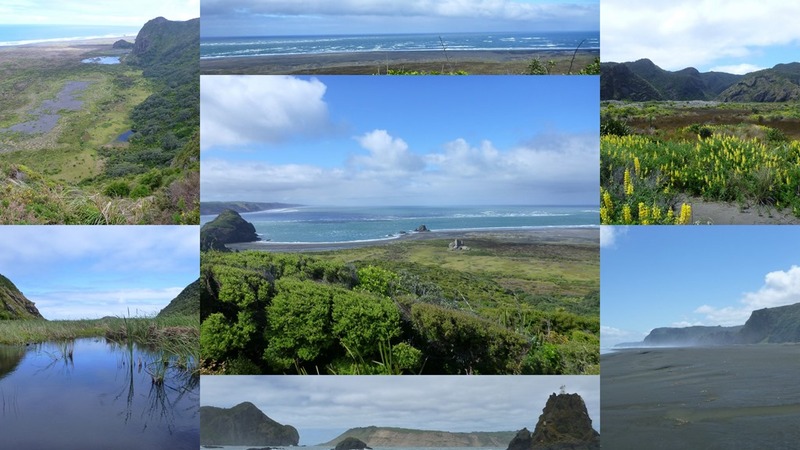 When I woke up on Sunday morning with a beautiful blue sky, I took all my gear and jumped in the car, direction Whatipu, the end of the road at the south end of the Waitakere Ranges. 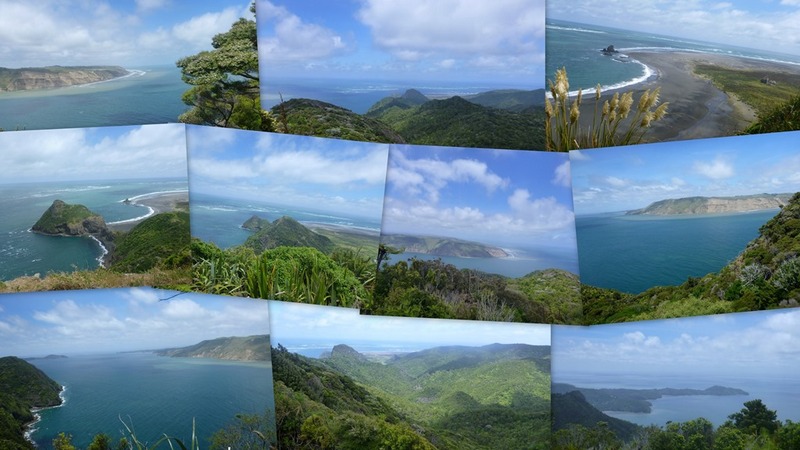 I walked up to the ridge, and had great views on the Tasman sea. 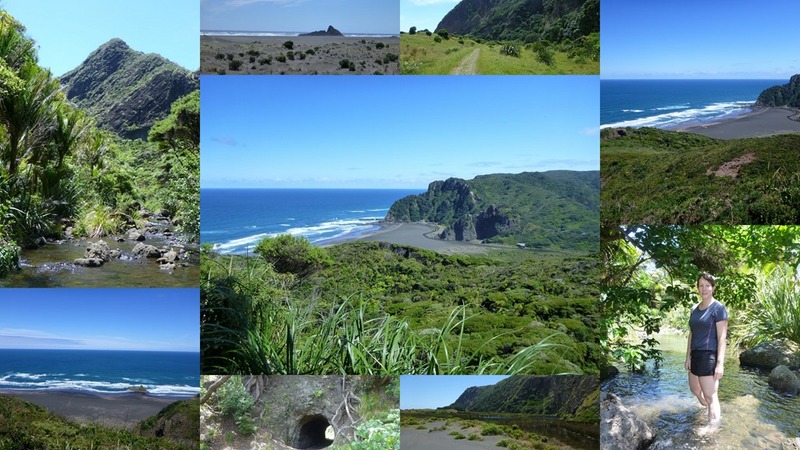 I went down a couple of kilometres further north, through a beautiful valley, and ended on a black sand dune. I went through the wetland (It wasn’t really smart, being alone and not really sure where to go / no signage, in the middle of the high grass and water up to my knees…) and eventually reached the beach after an hour of getting lost in the swamp. 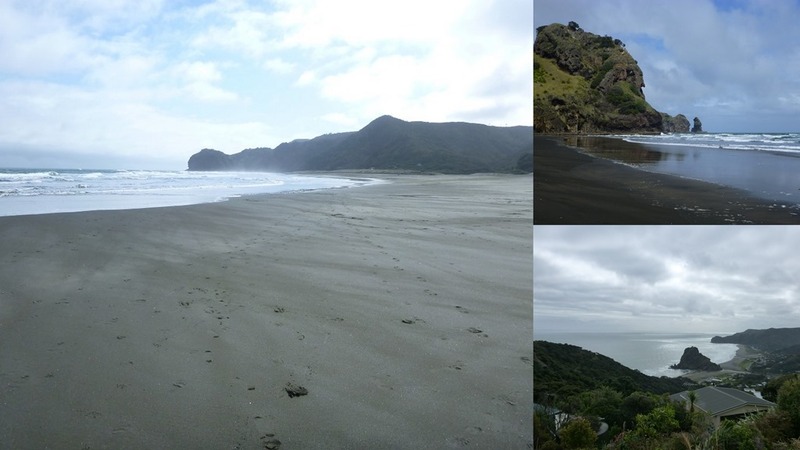 The walk back to Whatipu and the car was all along the beach, about 2 hours on a really wide black sand beach, where I did not see anybody! We went after a couple of days of rain to the Hunua falls, and it did not look at all like last summer (see here)… no swimming possible this time! Our last “day hike” for 2015 was in December, we went back to Whatipu and walk inland along (and across) a stream, up to a ridge and to Donald McLean Summit and the down along the southern ridge, along the coast. We were waiting for this walk to be an amazing clear sunny day. We did and it was great! It was worth waiting. I hope we will keep going out during our summer, if the weather doesn’t mess up our plans! Merci pour toutes les photos. Il n’en manque pas un peu de la dernière balade dans le Grand Nord ? C’est toujours un plaisir de feuilleter ton carnet de voyage(s), illustré, de surcroît. Oui même 5 mois en retard?! Un peu de patience siouplé pour les dernières photos… un vrai article se prépare, en cours de relecture…demain pitêtre!